How to interpret the Russian president’s words correctly. The Kremlin has unwritten rules prescribing how to talk to high-ranking officials. It is important to pay attention to how you are addressed, and to understand when a passage coated in florid language is aimed specifically at you. Additionally, it spells out how to clearly answer the president's questions. One of the Russian president's trademark phrases is "I hear you." Its use identifies anyone close to the Kremlin, like the phrase "I see you" identified the blue inhabitants of the planet Pandora in "Avatar." Translated from Kremlinese, "I hear you" means that this time your words will be noted, and if you are very lucky, your proposal will be accepted or request granted. The latter however is very much optional. Over the past several months, this phrase has gained broad circulation. First, it was picked up by tycoons, then by midlevel officials, and now it is widely used online. At the same time, the majority of those who use it do not fully understand its meaning. At one of his meetings, the president suddenly "forgot" the name of famous musician Yuri Shevchuk, although he addressed all the other participants at that gathering by name. At the time, the incident was particularly noted by the head of the Economic Analysis Institute, Andrey Illarionov. As a former Kremlin official, he understood full well the significance of the way a person should be addressed. The Kremlin is one of the few institutions in Russia where people still address each other by full name and patronymic, even when they are on first-name terms. Even when referring to the top leaders in their absence, Kremlin officials use their initials including the patronymic, e.g. V.V. stands for Vladimir Vladimirovich Putin; and D.A., for Dmitry Anatolyevich Medvedev. Of course, people in the Kremlin do address each other by first name too, but usually as a sign of special intimacy. Noticeably, people who used to be addressed by their first name, once they get a senior post in the Kremlin, all suddenly have a patronymic added to their name as a matter of course. There can be numerous interpretations to the way one has been addressed by a Kremlin official in public, but one thing is certain: it matters. Having said that, in the end the form of the address does not matter so much as long as you have been addressed by name. From the point of view of Kremlin inhabitants, if they address you by name, you are recognized as an individual rather than just a face in the crowd. That is why none of the Kremlin officials (and not only Putin) wanted to mention opposition politician Alexei Navalny's name. The thing is that they did not want to recognize him as worthy of any attention at all. Interestingly, former Yukos oil company owner and Russia's most famous prisoner Mikhail Khodorkovsky was granted a different treatment: Putin, albeit refusing to recognize Khodorkovsky as a political prisoner, referred to him by his last name or as Mikhail Borisovich. Speaking in confidence after he left all his posts, one senior politician, who has always been inexplicably talkative, said, "When I first came to the Kremlin, one intelligent person warned me: 'Speak in such a way so that you are understood by the one specific person you are addressing, while all the others cannot even guess what you mean.'" In the secret dialogue, the person who is speaking will very often give no indication whatsoever, either by look or intonation, to mark any bit of what they are saying as having particular importance and being addressed to somebody specific. The interlocutor's task is not only to hear it and draw the necessary conclusions but also not to give the game away, as it were. If you keep silent, trying to find a suitable pause in the conversation in order to say your bit, in 90 percent of cases you will leave the meeting without having achieved anything. Coming from an official, silence or a very long pause in reply to a question from Putin may spell rather sad consequences for the official's career: the president expects everybody to be as well-prepared as he is. 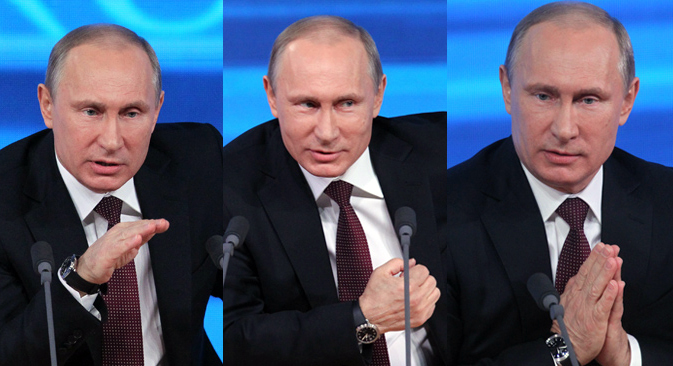 Putin is also often irritated at those who embark on a long-winded introduction instead of coming to the point. He either becomes aloof or starts to interject impatiently: "Did you want to say something?" "So what is the problem?" Very often this irritation affects the way he reacts to the issue once it is finally presented to him. He is either no longer interested in it, or is annoyed at it, as he is annoyed at the person who was speaking. One thing that nettles Putin even more than verbosity is being interrupted. He himself usually allows people to finish what it is they are saying (except that he may ask some questions on the way) and he expects the same from others.